Hearing back from my clients is always such a treat. Take a look at these beautiful photos and read about Caitlyn's story here. It’s been a little while, but I just wanted to let you know that your bouquet was a total hit at my Hawaiian-themed reception back in November. None of the guests had any clue that it wasn’t real, and everyone was amazed with your quality of work (including myself)! Contact me to find out if a bridal bouquet recreation in silk flowers would work for you! Here in Minnesota, we got a beautiful snowy weekend. It was picture perfect and great for building snowmen! I thought it would be fitting to showcase a wedding of all white flowers, to match the beautiful snow outside my window! Late this past summer I had a consultation with bride Melissa, her mother, and her mother-in-law. We came up with some lovely designs, despite the warm temps, for her December wedding. Her color was ice blue and she wanted to incorporate the color in her arrangements in some form or another. When you have a unique color that is not easily found in nature, then you have to get creative in trying to figure out how to include it in the arrangements. Once again, we turn to the ever dazzling, ever popular, and ever awesome bling! Check back tomorrow to see more of how we dressed up this wedding to reflect this magical time of year! I've been itching to do a wedding with a significant amount of succulents and I finally got my wish. When local bride Katy contacted me, she told me that she really wanted to include succulents for her up north wedding. I was more than happy to oblige! We did a variety of succulents for the different boutonnieres and then really went all out for her teardrop cascading bridal bouquet. Cascading Bridal Bouquet: Peonies, Succulents, Orchids, Seedum, Fern Curls, Millet, Dusty Miller. Chocolate satin ribbon with twine detail. A big thank you to Katy for allowing me to create with abandon. And a huge hug to my big brother Jon of 3104 Studios who shot these artsy fartsy images for me. Gorgeous right?! One of the best parts about working for myself is that I have the easy choice of putting the interest of my brides first. I spend a lot of time talking, designing, and meeting with my brides and we get to know each other over several months and sometimes years. Jessica contacted me in 2008 and through a series of events her wedding was postponed. I was delighted to hear back from her when her life was in a place where they were back on the wedding planning train and I was thrilled to be asked to be a part of it. I designed, contracted, and purchased all the flowers for her big day. I received a sad email a few weeks later that due to a medical emergency her wedding was being called off. I was heartbroken for her but wished her well. A short time later, she emailed me back saying that this marriage was a priority and they were going to be doing a small backyard wedding with friends and family. We worked together to adjust her designs and instead of doing big and over the top, they were having one attendant each. I was more than happy to work with her to make her dreams a reality. The bridesmaid bouquet - so classy! Jessica, if you read this, I wish you happiness and health in this exciting new phase of your life. Thank you for coming back and sticking with me - blessings! Here in my neck of the woods, we just got our first major snowfall. Pretty crazy considering it came at the tail end of February--usually we are already up to our elbows in snow. This put me in the mood to showcase some beautiful pictures sent over from Michelle at Maida Photography of a wedding in a classic color scheme for winter. And since winter is almost over, I thought I'd better get on it! Like I mentioned in this post, I've had lots of different color palettes, so doing a read and white one didn't feel like the same old, same old. And as you can see below the red wedding flowers really pop even against red dresses! Bride Katie contacted me and set up a consultation back in August for her January 21st wedding. She liked the looks of Beth & Bryan's wedding flowers as well as Amanda's silk wedding flowers. So we designed a hybrid of the two styles and came up with these beautiful arrangements. Katie carried red Roses, red Orchids, white Orchids, and Boxwood in her bouquet. Her girls carried solid red bouquets with both Roses and Orchids and finished off with a halo of Boxwood. Thanks again to Katie for the opportunity to design such classy arrangements. And a great big thanks to Michelle Maida for sharing these beautiful pictures of my designer silk wedding flowers. If you are looking for a great photographer, head on over to her website and check her out. 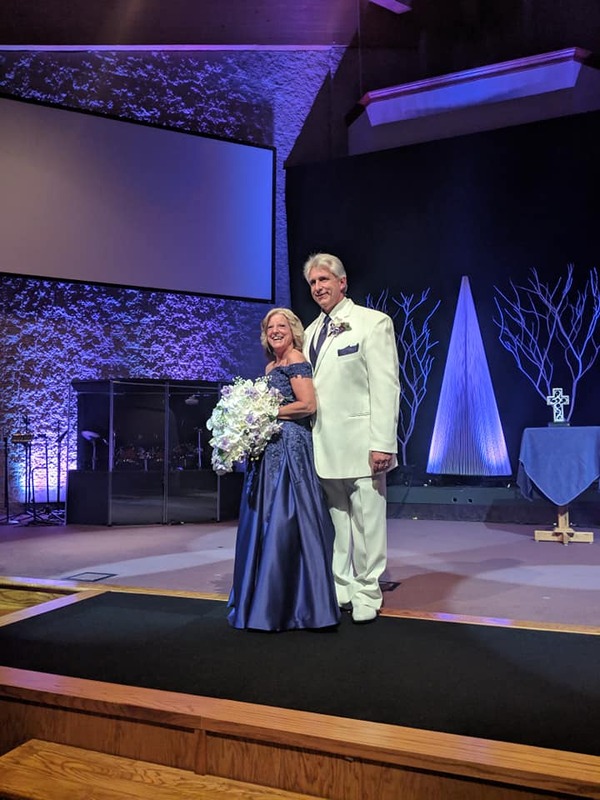 Here's a look at how we used Ruth and Michael's color scheme and chosen flowers to set apart the other bouquets but still keep with the overall look and feel of their wedding. These hand tied bouquets were perfect for spring but still reflected the jewel-tones that Ruth and Michael had chosen. It's been a while since I've done a shout out to my newest brides. So I thought I'd take a minute and say welcome to Julie, Briana and Katie. All 3 gals are January 2012 brides with their own unique styles and color schemes. Julie's deep purple and ivory flowers will incorporate Roses, Hydrangea, Button Mums, and Stephanotis. 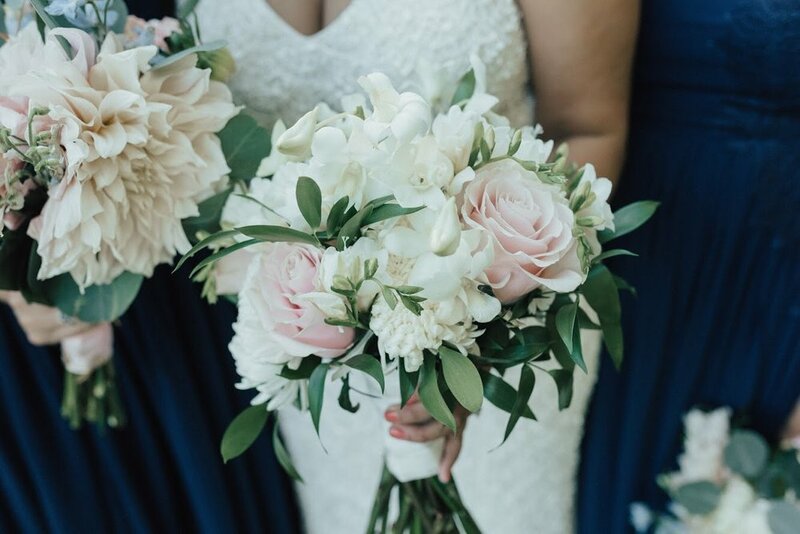 Briana's choice is all about the Peonies in vibrant magenta and white and Ranuculus in crisp white for the bouts and corsages. Katie's deep red Roses will be accented with red Orchids and lush Boxwood. I'm looking forward to bringing you sneak peeks of their gorgeous arrangements once they are all finished up -- but for now, I better get back to work!